Pineapple is a very popular fruit worldwide because of its sweet, delicious taste and juicy texture. In addition to tasting good, pineapples offer numerous nutritional benefits, which prompts many that are hoping to follow a healthy lifestyle to increase their intake of this fruit. Here outlines some of the many benefits of eating pineapples below for your reference. The bromelain content of the pineapple core and stem helps the body break down protein particles during digestion, encouraging overall digestive health. 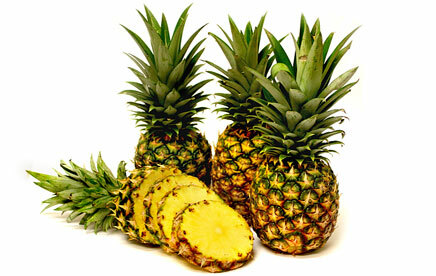 Bromelain also has anti-inflammatory, anti-clotting and natural detox properties. Increasing your intake of manganese through pineapples can help to increase your overall energy levels and protect the cells from free radicals. Manganese helps the body to utilize biotin and thiamine to better synthesize fatty acids and maintain bone health. The high amounts of potassium in pineapple juice can help to improve the balance of electrolytes in the body that can promote kidney function and help you avoid muscle soreness and cramps. Potassium also helps the body to control the blood pressure and heart rate. Vitamin A and beta-carotene can help to eliminate free radicals while improving the immune system and eye function. Because pineapples are such a good source of beta-carotene, eating pineapples can help to reduce the risk of macular degeneration that damages the retinas, the first cause of adult vision loss by up to 36 percent. Pineapples naturally contain few calories, cholesterol or saturated fat, but are high in fiber which makes them an ideal snack food for those that are trying to lose weight. The serving size for the nutritional information below is based on one cup or 155g of diced pineapple. * % Daily Values is based on 2000 calories diet. Pineapples are freshest between March and June. Both large and small pineapples have a similar quality, but you should seek out a pineapple that is quite heavy for its size. The fruit you select should not have mold, soft spots, darkened eyes or bruises that indicate that it is no longer fresh. The pineapple you pick should also smell sweet at the stem rather than sour, musty or fermented. You can check for freshness by tapping your finger against the fruit. If it is ripe, the pineapple will have a solid, dull sound while those that are immature or low in quality will exhibit a hollow sounding thud. A ripe pineapple perishes quickly at room temperature, but is also very sensitive to cold. Do not keep pineapple in a refrigerator for long periods of time, only placing ripe fruit in cold storage for 1-2 days before using. For best results, consume your pineapple very soon after purchase. You can peel a pineapple and consume the flesh directly to get the benefits of this fruit. There are many techniques you can use to accomplish this task. Chop off the base and crown of the pineapple with a knife then peel the skin off the fruit by slicing down the sides. Carve out any eyes that remain with the tip of the knife. You can also use a pineapple corer to quickly peel and remove the fruit from a pineapple. Unfortunately, this may waste a great deal of fruit. The ananas available at the grocery store are often cut using a similar method. Once you have removed the peels from the pineapple using whatever method you prefer, simply cut the pineapple into the size chunks you desire and consume. You can also add pineapple to drinks, salads, desserts, jellies or jams for extra flavor. Garnish a cocktail or wine glass by rubbing a piece of fresh pineapple along the rim and dipping the glass into a dish of desiccated coconut. Add the pineapple wedge and cherry to the rim of the glass to complete the garnish. 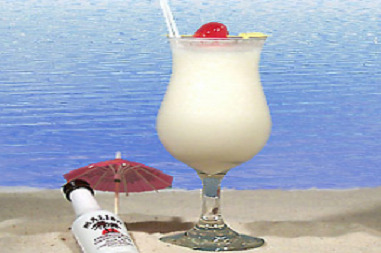 Shake the pineapple juice, rum and coconut milk with ice in a cocktail shaker, then strain into a glass filled with ice. You can omit the rum if you would like an alcohol-free version of this drink. 4 tablespoons cornstarch combined with 4 teaspoons water, salt and pepper. Heat the oil over medium-high heat in a non-stick skillet. Season the chicken strips with salt and pepper and add them to the oil, cooking until they have browned. Remove the chicken and add the green and red peppers to the pan, cooking them for one minute. Add the reserved pineapple juice, pineapple, vinegar, sugar and chicken stock to the peppers, bringing the mixture to a simmer until the sauce begins to reduce. Add the cornstarch and water mixture and add the chicken strips back into the pan, cooking for 5 minutes. 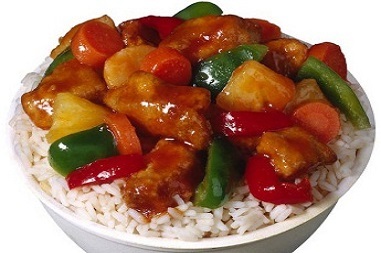 Serve the dish over rice.